Every opportunity I get I introduce our 9 month old to sensory experiences. Everything in the world is new to him and I love watching him discover and learn. This morning I whipped up a batch of play clay he can squish through his fingers, mold, poke, and throw. I’ve been meaning to buy some Playdoh, but was hesitant because I knew it’d go straight into his mouth. Most of the brands in the stores are non-toxic and I doubt a small amount would be harmful if ingested. The first-time-mom in me still worries, so this recipe uses all food-based ingredients. Let’s not forget it’s cheap and fun to make. Here is the basic recipe I used, which is very fast and simple. Feel free to jazz things up with a rainbow of colors. For the record, I still don’t want my son eating this nor will I encourage it. I also won’t freak out if he does sneak a (salty) taste. 1. Whisk all dry ingredients in a medium pot. 2. Mix all wet ingredients in a medium bowl or measuring cup. Add a drop or two of food coloring. 3. Add the wet ingredients to the pot, stirring until the mixture is smooth and lump-free. 4. Over medium-low heat, constantly stir until a dough forms, around 3 -4 minutes. It should still be slightly sticky. 5. Remove the dough and knead it on a solid workspace until no longer sticky. 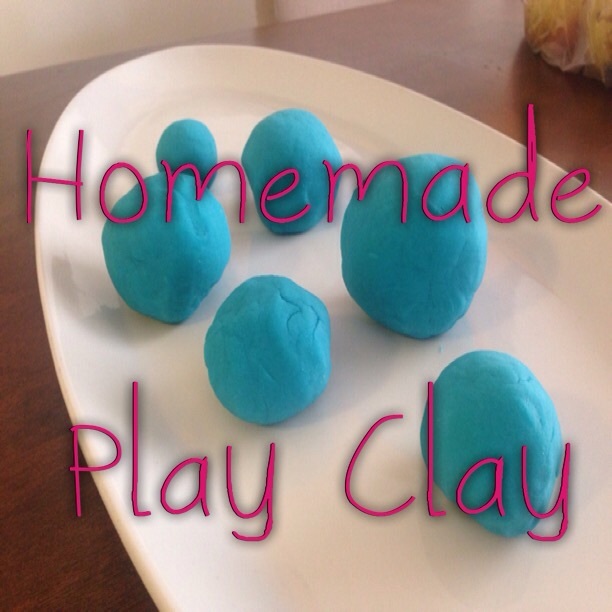 The play clay can be stored in an air-tight container at room temperature for several weeks. Enjoy!